I would only hang around a little bit Never stayed in love so long. Long enough to drag us down. 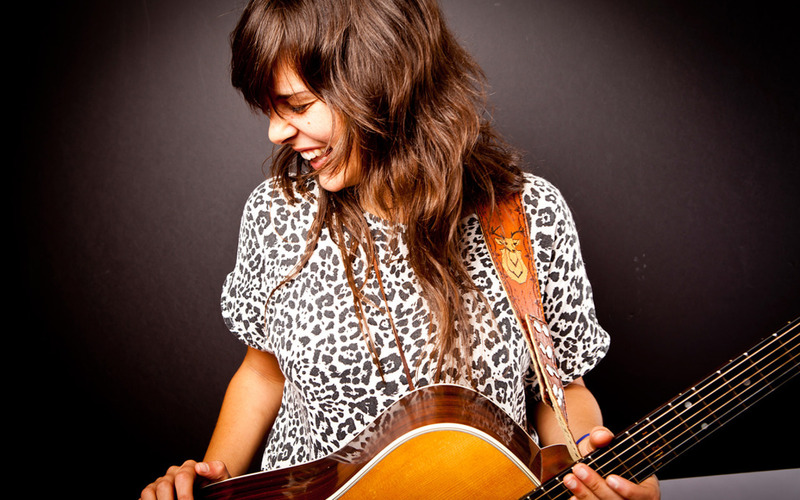 Madi Diaz is a 25-year-old singer-songwriter currently based out of Nashville, TN. Originally from the Amish country in Pennsylvania, Diaz grew up in a musical household. She moved to Philadelphia in her teen years to attend the School of Rock, a program to help talented youth learn to play instruments and be a part of a band. Continuing her musical education into college, Diaz attended the Berklee School of Music in Boston. She continued her musical aspirations after graduating, working with fellow student Kyle Ryan to record country-tinged album in Hawaii. The result was Skin & Bone released on the label tinyOGRE. Ryan and Diaz continued their partnership, later moving to Nashville, TN in 2010 and recording Plastic Moon, an album of sweet indie pop featuring Diaz's maturing songwriting and vocals. Ironically, Madi Diaz made an Americana-steeped roots record in Hawaii, then recorded a breezy indie-pop album a couple of years later in Nashville, TN, the home of country. But we'll forgive her geographic idiosyncrasies when the melodies sparkle this beautifully, and the songwriting is this heartfelt and hooky. 25-year-old Madi Diaz grew up in Amish territory, but quickly got on track for about as much formal pop music training as you can get, attending The School of Rock in Philadelphia as a teenager, then enrolling in Boston's prestigious Berklee School of Music. Whether she learned it at school or through personal gumption, Diaz has nailed the singer-songwriter/indie pop blueprint, filling in the details with her own brand of charm. Diaz's sophomore album Plastic Moon sees her mining classic acoustic guitar-based pop, and really making her mark on the more downcast, thoughtful moments of the album. “If You Only Knew” leans towards her Americana debut, laying down a hypnotically simple and repetitive picked guitar as Diaz sings in a 21st century style of old Appalachian or Scots ballads. She could hardly have thought up a better line than “When You find me dear, we'll listen to the sound of water rushing down,” as the song continues to unwind in meditative beauty. “I Know” begins with a straight ahead rock beat and classic, picked indie rock guitar (think Death Cab For Cutie) as Diaz goes all out in search for radio-friendly hooks. That tactic can get a bit saccharine at some points on Plastic Moon, but here (as well as many other spots) her earnest vocal hooks are a welcome addition to the skillfully executed indie pop instrumentation. Plastic Moon's highlight comes seven songs in with “Let's Go” the kind of heartfelt, ultra-sweet pop song that makes anyone within hearing vicinity ask, who is that!? Diaz takes a turn for the dramatic, singing in gorgeous dejection over rumbling bass and suspenseful drums. Her chorus of “Let’s go-oh-oh, oh-oh/To a place I know-oh-oh, oh-oh-oh” is the best hook on the album, and pretty much guaranteed to get stuck in your head. For anyone that likes their acoustic ditties genuine, heartfelt, and down to earth, Diaz will be up your alley.